Beautiful and comfortable home, plenty of room for family and friends to make those unforgettable vacation memories of the OBX. Enjoy your own private pool and hot tub and the private walkway to the beach. Sit atop the dune in the gazebo with your favorite beverage and enjoy the view and sounds from the ocean. Close to many wonderful restaurants, shopping and family friendly activities. 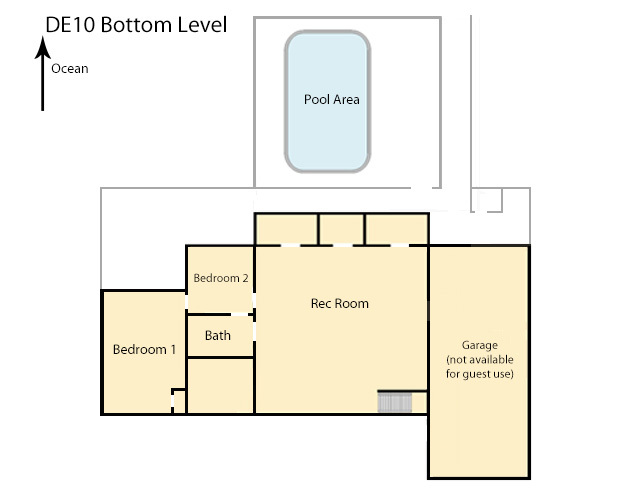 Rec room with a pool table and wet bar with a mini-fridge and microwave and full size refrigerator. 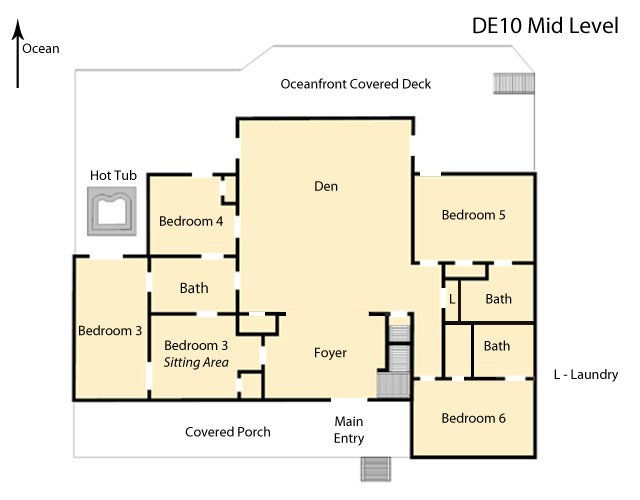 Mid-level den with TV and wet bar mini-fridge and microwave and deck access. TVs, DVD player and WiFi. * Village at Nags Head Beach Club amenities are not included with this home. The fireplace is not available for guest use. 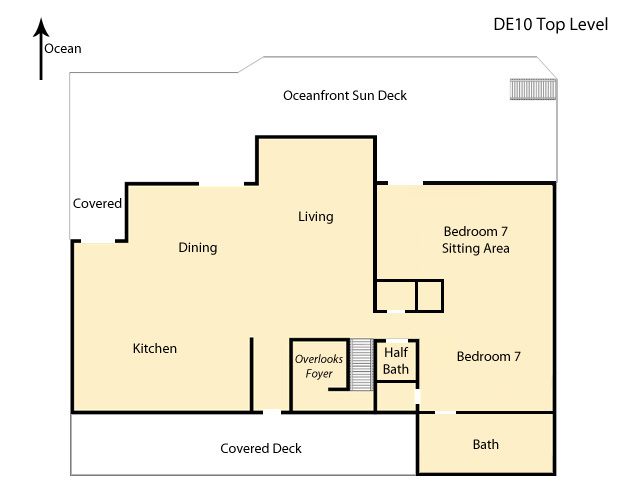 DE10 was a fantastic layout for my family because it offered living spaces for multiple couples and their children. The upstairs master bedroom had a comfortable seating area for when the grandparents wanted to "get away." There was even a small office area adjacent to one of the downstairs bedrooms so anyone who just had to bring work to the beach could have a private area. The pool was fine except for some nails that needed attention on the deck. Kitchen layout was well-designed. The only negative was the dune walk to the beach, difficult trek back up the hill for those of us with old knees. Several minor maintenance issues were addressed by Village Realty very promptly. The weather and ocean conditions were perfect. We enjoyed our stay in this house, the layout was prefect for us, plenty of room and seating for everyone! The updates to the main areas are great, bedrooms and bathrooms could use the same but were still nice. Addition of blackout shades to all bedrooms would be amazing, rooms got very bright! Pool was a good size and outside is well equipped with seating also. Would love if you could see the beach from the house, those darn dunes. Beach access is good but note getting back up that dune is a workout if you have anyone with mobility issues. We were happy with Village realty, pretty quick response on service calls although we called in the first couple of hours about a broken ceiling fan (like about to fall out of the ceiling) and they came to look at it same day but said they needed an electrician and he did not show to fix it until our last day there, not a huge deal but for their reference. Overall a very good experience with this house and Village Realty, would definitely stay there again! Stayed with 12 adults and 6 kids (6 small families) during the 4th of July and had a blast! House was just the right size for us. Kids loved the pool, the beach was right there and we were near plenty of stores to get food. Some minor inconveniences were handled extremely quick by Village Realty. When the lower half of the house had the central air go out, VR brought multiple window AC units to cool down. When the upstairs fridge didnt work, they came with another within no time. No food was spoiled! We had a great time and would recommend this house to our friends! We would return, but families are growing and we might need something even bigger next year! We had a great time in this house. It is huge and can easily accommodate 2-3 families. The kitchen was very nice and the fridge was huge. The pool and hot tub were clean and clear. We did not have any issues with bugs in the house. We had some minor issues that were repaired within 24 hours( kitchen drawer broken, some door handles fell off, some nail pops on the decking). The dishwasher was broken when we arrived. We were warned and they provided paper plates. It was fixed within 2 days. The previous renters left us some dirty and wet plates stacked in the cabinet. The dune top covered deck was great. The beach here is wide and fairly empty most of the time. Basement would be great for little kids. They cant get to the pool without coming upstairs. On the other hand if there was a fire there is only one exit, up the stairs. Minor issues include checking regularly for nail pops on the decking and trimming back the thorny vines on the beach walk. Also, the oven needs to be cleaned. This was our first experience ocean front. We have been coming to the outerbanks for 24 years and has always stayed in Duck. We really like the location of the house and being on the beach. Loved the Pool . The Master bedroom upstair, beautiful. Master bedroom second floor, also very nice. Village Realty was great, they responded quickly to any problems. With all this being said we will not rent this house again. The rails on deck are very loose ,all decking floor boards are coming up. I stepped on nail heads that were out of the boards. The shrubs,steps and walking area were over grown with sicker vines, that we cut out so babies would not get cut. There was no access outside from basement, which is not safe. The rooms downstairs only had one access to bathroom and out of the bedroom, which was walking through someone else's room. (so odd). Ants were horrible inside and out , we lost food in the cabinet from this. The windows were dirty when we got here and one bedroom had an old open bar of soap in shower. Thank you for your survey. I see that you called in most of these issues, thank you for the opportunity to take care of these items for you so that you could enjoy your vacation. We also appreciate the information about the decks and we will definitely be taking a thorough look at them so that any safety concerns are addressed. We also wanted inform you that the home was recently purchased and the interior was completely updated! The new owners also took care of pool deck boards, painting, and landscaping. It is truly a night and day difference and we hope you enjoy viewing the updated photos.